Mykonos is one of the most buzzed about vacation islands in the world. It is located in the Aegean Sea of Greece. 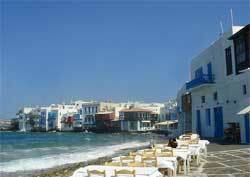 Mykonos has a picturesque town and is famous for its lively party atmosphere. In the 1950s Mykonos was a haven for hippies who came to the Greek Islands. In the 1960s Mykonos became a mecca for jet setters. Then, it slowly metamorphosed into a spirited party scene for young upper middle class vacationers from around the globe. That's its current personality. In the afternoon the youth gather at the Paradise and Super Paradise beaches for sunning, drinking and partying. Music loudly blares from the bars. When the sun sets, the drinking and partying become more intense and switches to clubs (or at organized beach parties). This lasts till dawn in this party haven of Greece. The Greek Island of Ios is also famous for its non-stop party scene. But there are major differences. Too many of the revelers in Ios (mainly in their late teens and early 20s) act in immature and loutish ways. In Mykonos, the typical merrymaker is slightly older, better educated, and higher-incomed.